Wood is a natural material that has many uses. The most basic use for wood is to make a fire to use for warmth or cooking. For example, milled wood is used to make boards to build houses and other structures. The uses for wood depends on a particular need or preference. However, the first step in using wood is learning how to cut down a tree. One of the most important aspects about cutting down trees is knowing which tools are the best ones for the job. For the most part, you have the option of using an ax or a chainsaw. Fortunately, the technique is essentially the same regardless of the tool being used. This makes learning how to cut down a tree easier as you get more experience. When choosing between a chainsaw and an ax, it is clear that a chainsaw will be easier than an ax. However, most people may not have a chainsaw on hand to cut down a tree. If you want to use a chainsaw, then you may need to buy one. However, you can always see if there is one you can borrow from a friend or any family member since it is a tool that isn’t used very often. 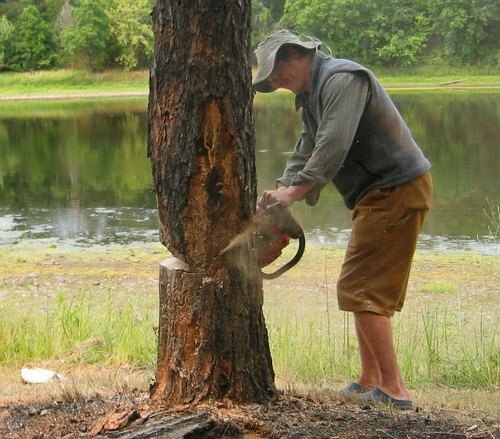 If you don’t know how to cut down a tree, then a few pointers will be necessary. The first thing to know for how to cut down a tree is safety. This will mean you need to know where it can possibly fall and keep any onlookers away from that area. You also need to be aware of the area where you are standing. If you don’t know how to cut down a tree correctly, then severe injury could occur. Knowing how to cut down a tree is only the first step. Once any tree is cut down, then removing it will be necessary. Much like learning how to cut down a tree, taking a tree apart once it’s down is all about cutting it into smaller pieces.